schezwan masala dosa recipe with step by step photos. this is a crispy, spicy and tasty schezwan masala dosa recipe. 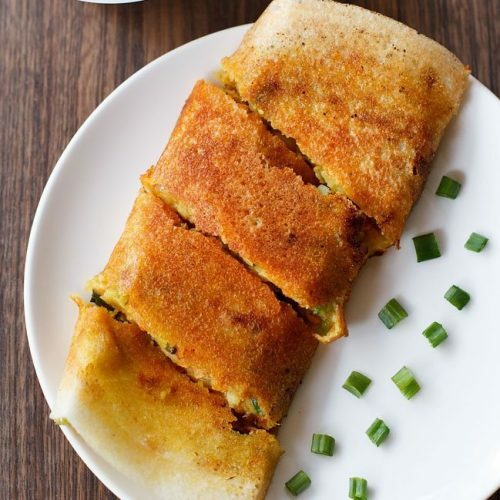 schezwan masala dosa is a fusion of the south indian and indo chinese cuisine. rinse and then boil 5 medium sized potatoes in a pressure cooker with just enough water covering the potatoes for 3 to 4 whistles on medium flame. when the pressure settles down on its own, open the lid. remove the potatoes and let them become warm. then peel and chop them. keep aside. when the potatoes are pressure cooking, you can grate or finely chop veggies. heat 2 tablespoons oil in a kadai or pan. add 1 teaspoon mustard seeds and let them crackle. then add ½ teaspoon cumin seeds and saute till the cumin seeds also crackle. next add 1 teaspoon finely chopped ginger, 1 green chilli - chopped and a pinch of asafoetida. mix very well. then add ½ cup chopped onions and 8 to 10 curry leaves (chopped). mix very well and sauté till the onions turn translucent. then add ½ teaspoon turmeric powder (haldi) and mix very well. add the chopped boiled potatoes and salt as per taste. add ½ cup water. mix very well and bring the curry to simmer for about 4 to 5 minutes on a low flame. the potato masala will thicken. lastly switch off the flame and then add 2 tablespoons chopped coriander leaves. heat a tawa and using a kitchen paper towel or cotton cloth or an onion halve, spread oil on the tawa. pour a ladle full of the batter and spread to get a round dosa. cook the dosa on a low to medium flame. when the top sides gets cooked, add about 1 to 2 teaspoons butter and 1 to 2 tablespoons schezwan sauce on the dosa. you can add butter and schezwan sauce less or more as required. spread the butter and schezwan sauce on the dosa. now add some of the grated or chopped veggies and some chopped coriander leaves. place a portion of the potato masala. with a spatula, first mix and then spread the entire mixture evenly on the dosa. cook till the schezwan masala dosa is nicely crisp and browned from the base. fold one side. then fold and overlap the second side. gently turn over the schezwan masala dosa on the tawa. with a pizza cutter or spatula cut the dosa in three or four parts. if you have used a non stick pan, then keep the schezwan masala dosa on a plate or chopping board and then cut. serve schezwan masala dosa hot with coconut chutney.